With a parachute specially designed for two people, you will board an aircraft and climb to around 13,000 feet (over two miles high!). When you and your instructor leave the plane, you will fall at about 120 mph, descending to 5,000 feet in around 45 seconds. At this point, your instructor will open the parachute and fly you safely back to earth! During the six minutes or so under the parachute, you will enjoy breathtaking and unique views of the local area and beyond. 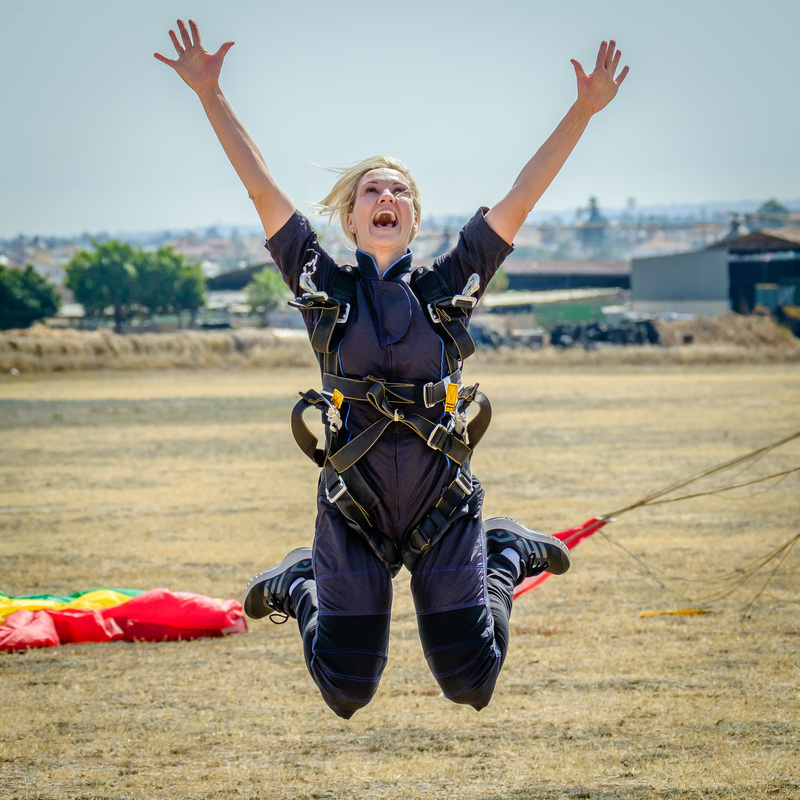 On the day of your skydive your instructor will explain in detail what you have to do and what will take place during the flight up, the free fall descent and the ride down under the parachute. This briefing normally takes around 20-30 minutes. 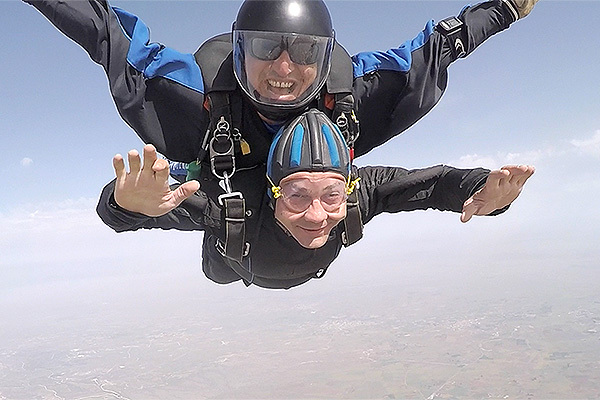 After this, you will be provided with a skydiver’s jumpsuit to go over your clothes (you should wear comfortable clothing, such as a track suit, and a pair of trainers). After fitting the tandem parachute harness (and appropriate headgear and goggles) you are ready to board the plane for the 20 minute ascent. Then it’s one glorious leap out into the blue! 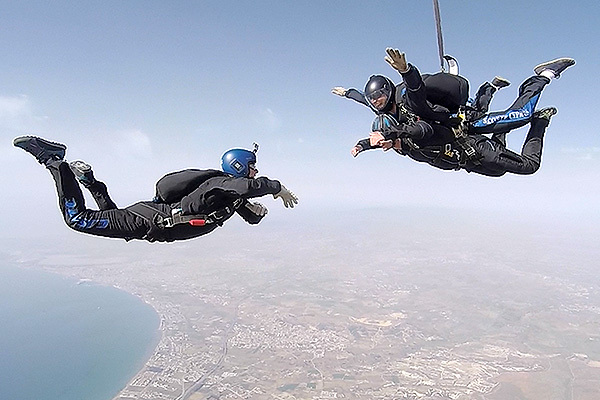 If you want to see how you look in freefall, to re-live that amazing feeling again plus show all your family and friends, ask for the training, descent and landing to be filmed. Although this will add to the cost of the Tandem jump, it will give you an wonderful record of the event for evermore. ​We will edit the film for you on the day if there's time otherwise we will deliver it a few days later via post or email. we have a maximum weight of 95.4 Kgs (that's 15 st in old money) and the weight is clothed + shoes. Your BMI should not be excessive either and the Tandem Instructor may ask you to step on the scales. you will be required to sign a medical declaration. If you are unsure you qualify, please refer to the BPA Tandem Student Medical declaration form and guidance notes, form numbers 115A & 115B. your Tandem booking will not be confirmed until you pay a non-refundable 50 Euro deposit (per person); the bank details will be sent once we have your full name, age and height. the cost is 250 Euros per person, British military personnel and dependents are charged 200 Euros per person, filming costs remain the same. filming will add 90 Euros per person. We cannot share filming cost between two or more people as each Tandem student has their own cameraman assigned to them. We now have a new booking system to make it even easier for you to see what dates are available and then book you Tandem Skydive. Once we see your interest, you will be contacted so please leave a local telephone number or preferably an email address. To see the booking form, just click HERE.